I just found out something amazing. You see that scarf? That epic 20-foot-long monstrosity? 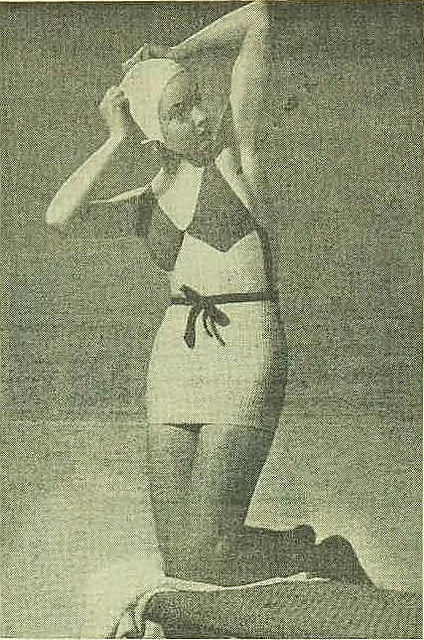 I always assumed that it was a deliberately-planned costuming decision. You know, something to make the Doctor look fun and quirky. But I just learned the real reason, and it’s so much better than I could have imagined. The costume designer for the show, James Acheson (who was not a knitter), picked out the yarn colors for the scarf, but didn’t know how much yarn went into a normal-sized scarf. He gave the yarn to a local knitter (with the extremely British name of Begonia Pope) with vague instructions to make a striped scarf. Apparently, she took him at his word and used all the yarn. And, instead of stopping at a regular 5- or 6-foot-long scarf, she kept going, until it ended up more than twenty-feet long. After some understandable surprise, the cast and crew decided they liked the scarf, and the rest is history. 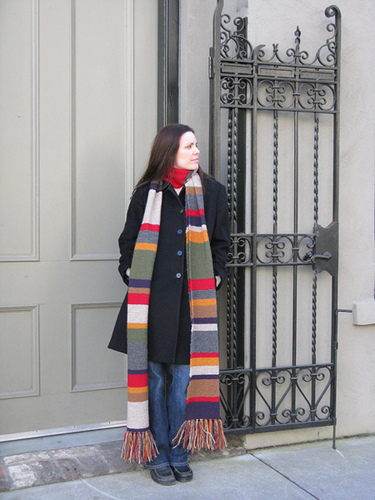 Want to make your own Doctor Who Scarf? Load up on lots (and lots and lots) of wool and get to work! 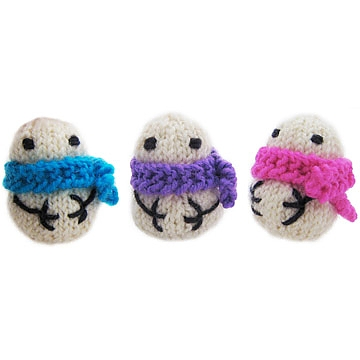 Do you have any favorite pop-culture knitting? 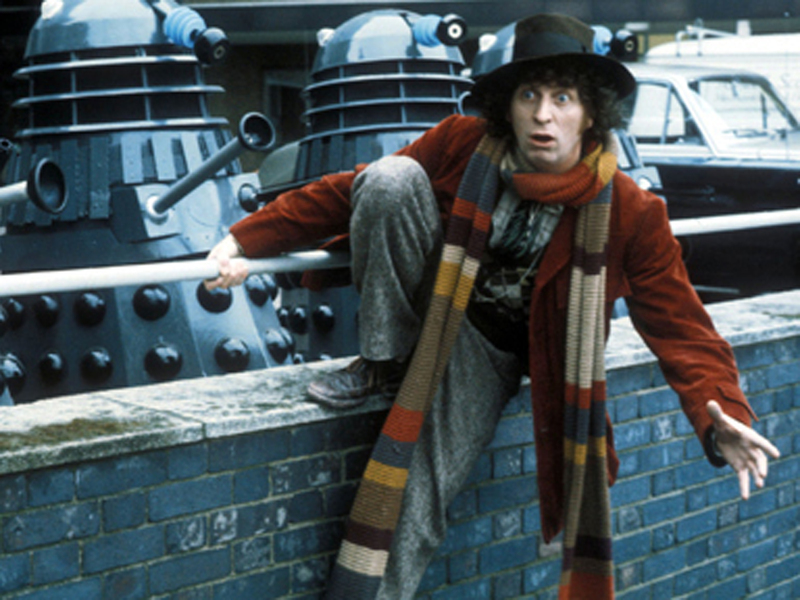 This entry was posted in FYI and tagged doctor, doctor who, doctor who scarf, fourth doctor, scarf, the doctor on March 27, 2015 by onemilljellybeans. 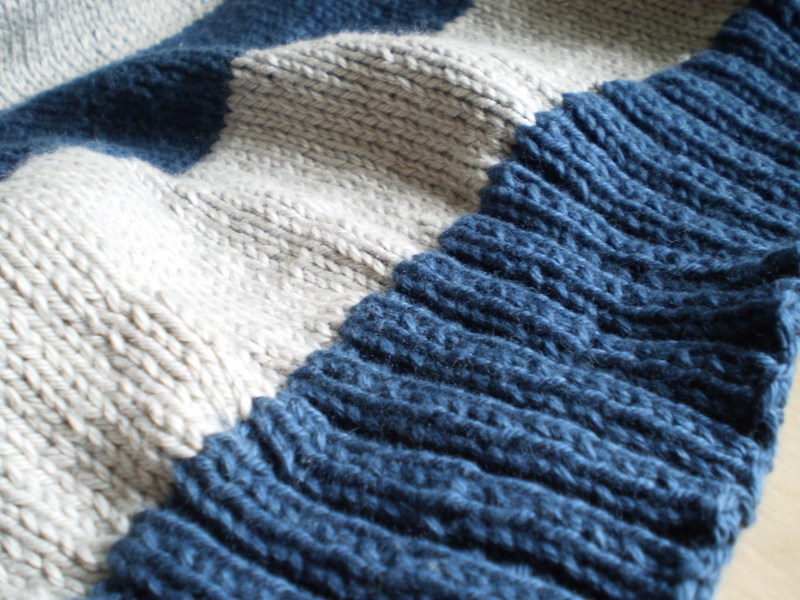 I’m kind of in love with the linen stitch. It’s haunting my dreams and dancing through my head. I may have a problem. It’s so fiddly and such slow going, but I absolutely love how it looks. And, even though it takes a while to work up, it’s a really simple pattern-so easy to memorize! RS rows: (K1, bring yarn to front, slip 1, bring yarn to back) repeat to end. WS rows: (P1, bring yarn to back , slip 1, bring yarn to front) repeat to end. Easy! Let’s do it together. And your wrong side will look all cool and bumpy and textured. I almost like it more than the right side. I’ve made these samples using a different, random color each row, but the linen stitch looks great in one color, knit with variegated yarn or using two or three repeating colors. 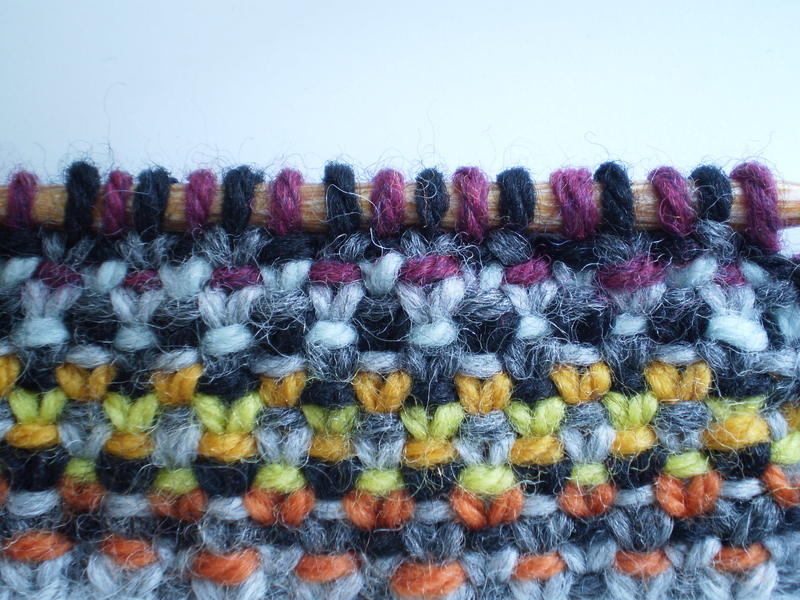 The linen stitch is a great way to play with color mixing! 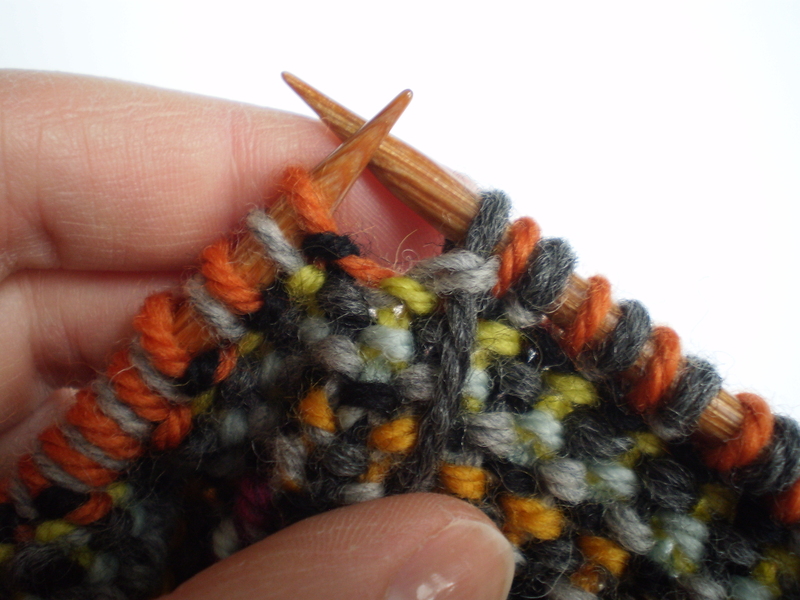 Have you ever used the linen stitch before? What did you make with it? 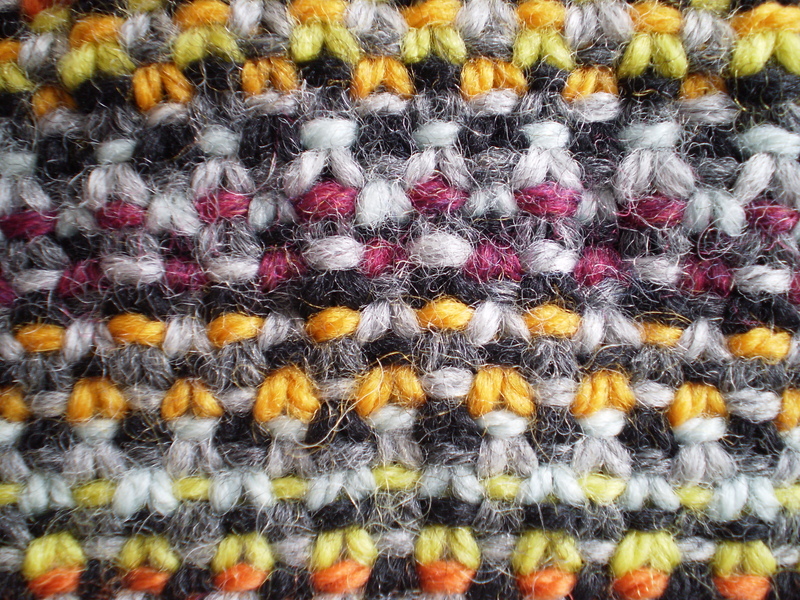 This entry was posted in Tutorial and tagged color mixing, how-to, knit, knitting, knitting stitch, linen, linen stitch, step-by-step, tutorial on March 20, 2015 by onemilljellybeans. You know how they say that goldfish have three-minute memories? 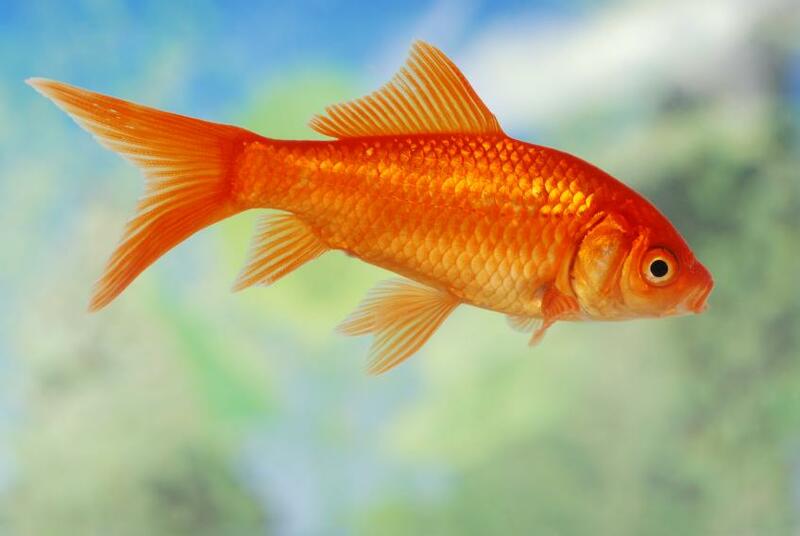 I kind of feel like I have developed the attention span of a goldfish. 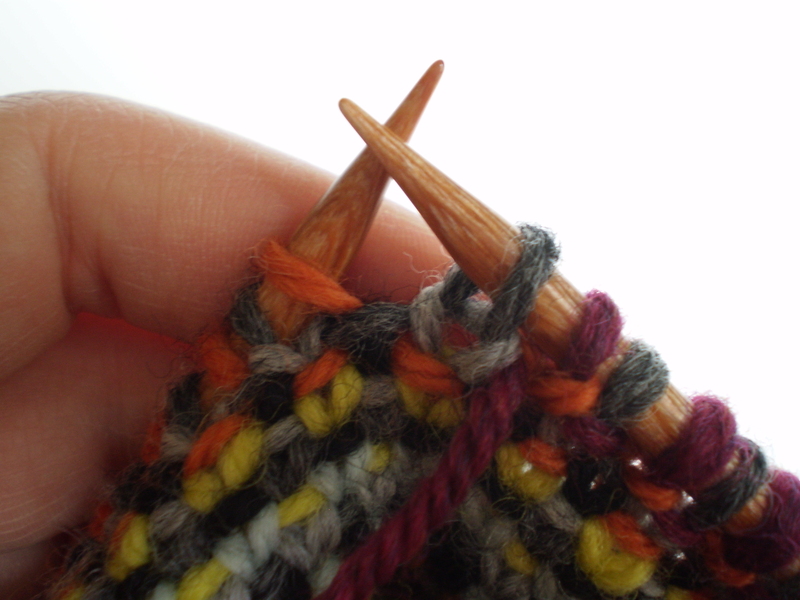 I’ll knit a row or two, and then get completely bored and start looking around for something else to do. Usually, give me my knitting, a cup of tea and Netflix on the TV, and I’m a happy camper for a good couple hours. But not this week. Maybe I’ve had too much caffeine. Or not enough. Maybe the planets are out of alignment. Or a spell cast by an evil sorceress. Or maybe it’s just the result of the wicked cold I’ve been fighting off the last two weeks. Whatever it is. I don’t like it. Do you have any tips on how to fight my goldfishitude (which is totally a word)? What do you do when you feel like this? This entry was posted in FYI and tagged attention, attention span, bored, boredom, goldfish on March 18, 2015 by onemilljellybeans. 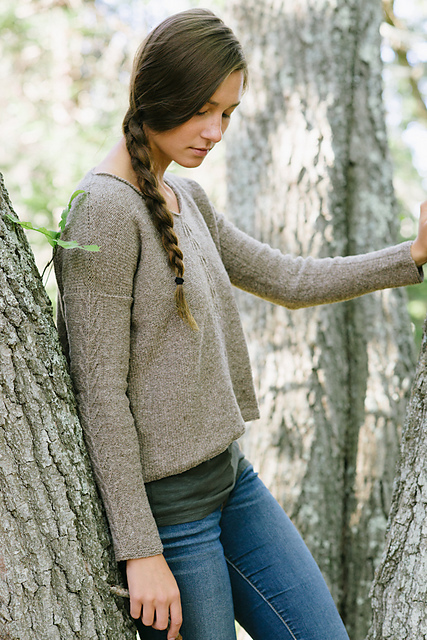 Lately, I’ve been feeling some knitting wanderlust. 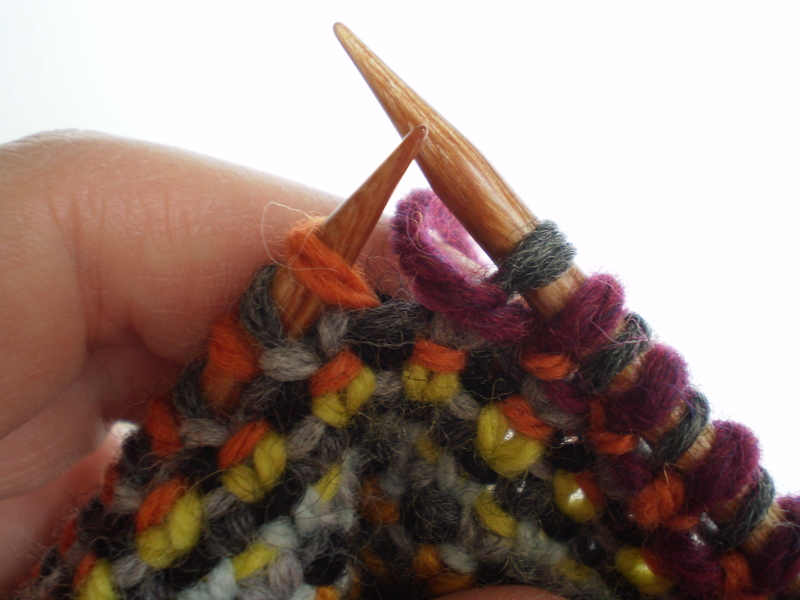 You know that feeling- when you’re just not content working on any of the projects on your needles. I’ll do a couple rows on my husband’s sweater. 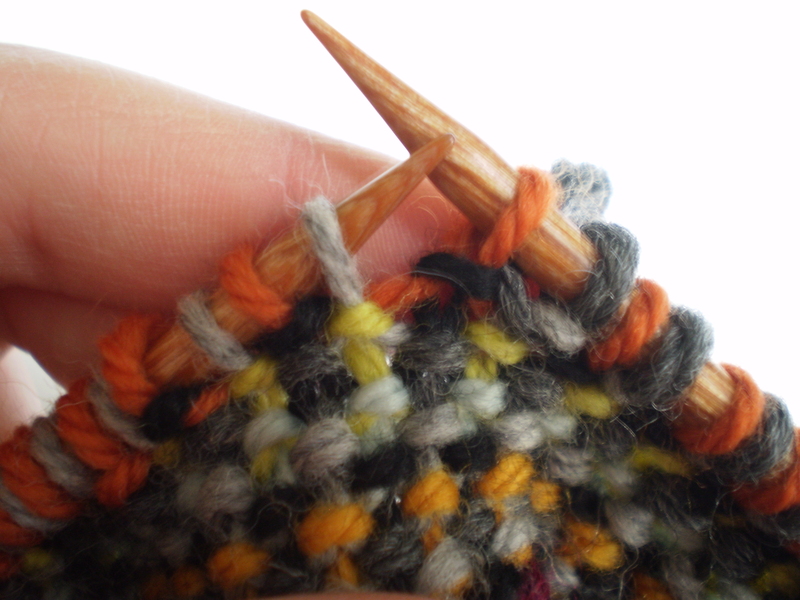 A few stitches on a pair of socks that have been languishing since December. 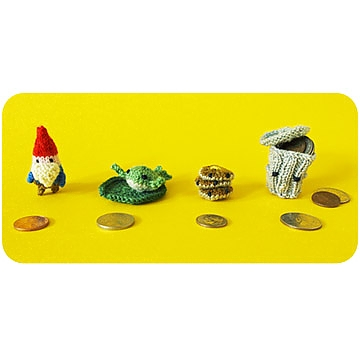 I’ll make something tiny and silly. 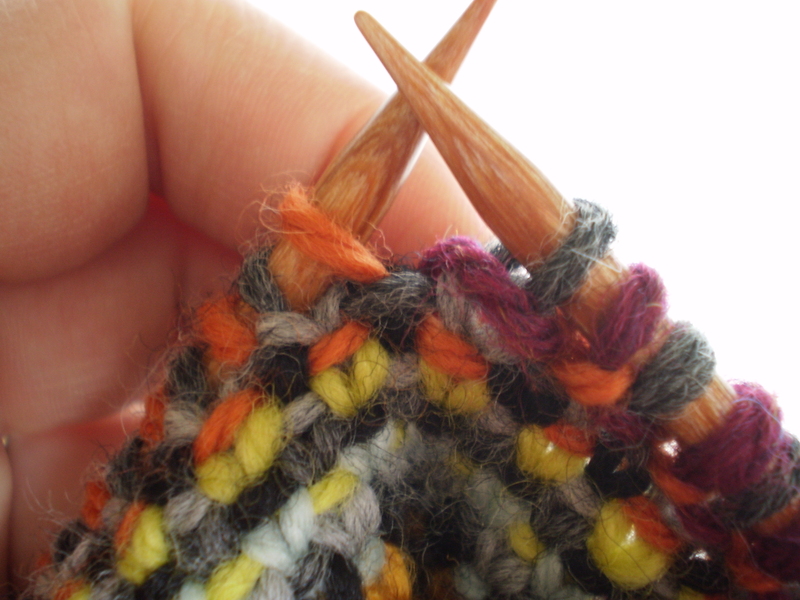 But, sometimes you just need to go digging through your stash of patterns and leftover yarn and start something new. 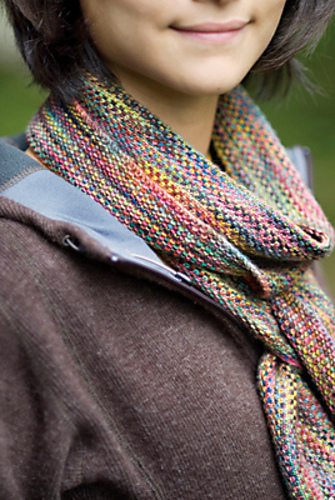 I found my copy of this pattern (the Koigu Linen Stitch Scarf by Churchmouse Yarns and Teas). 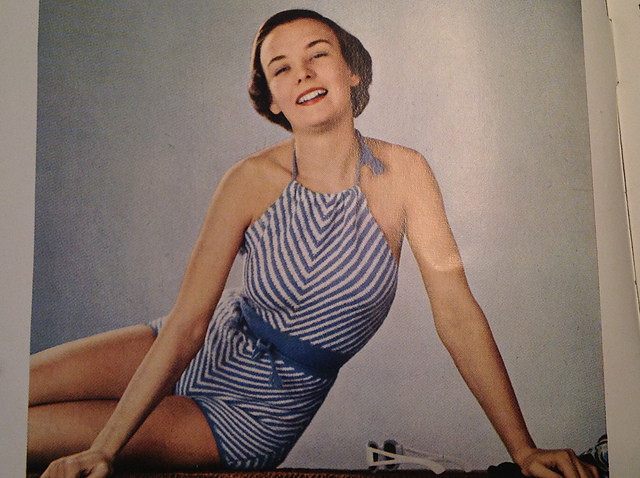 It’s been on my to-knit list for years. 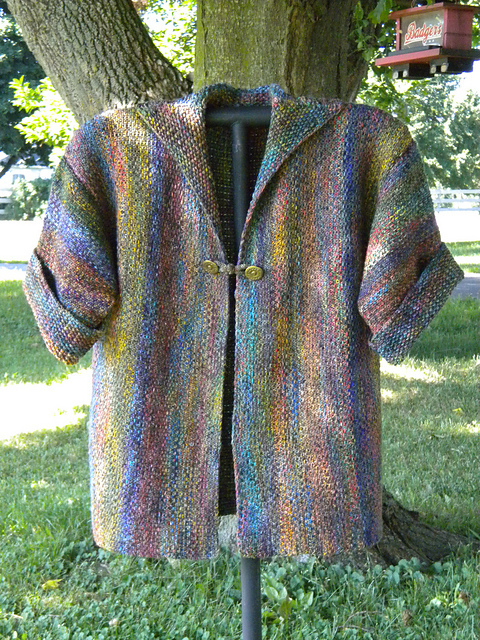 Unfortunately, I don’t have the beautiful multi-hued yarn it calls for. But, I do have a bunch of little scraps of pretty Patton’s worsted wool. So far so good! I love the way the colors get blended together. It’s funny, how such disparate colors end up looking so nice together (there’s no logical reason that neon green and bright orange should look good together). 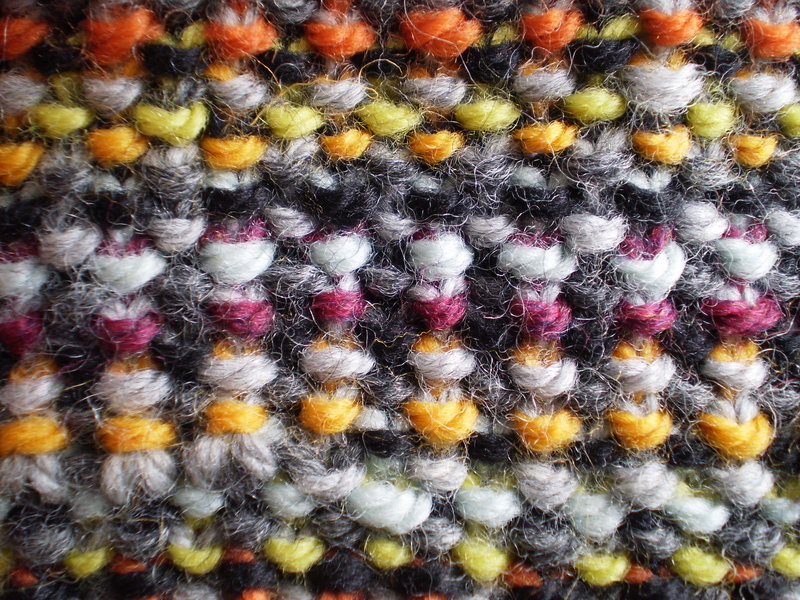 And, I have totally fallen in love with the linen stitch. 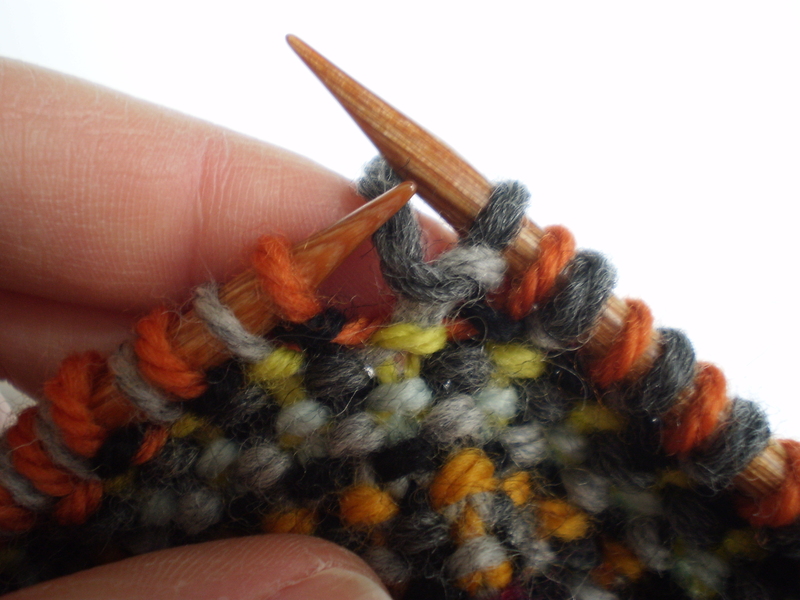 For whatever reason, this stitch is scratching my knitting itch. I love anything that uses slipped stitches, and changing color every row keeps me entertained. 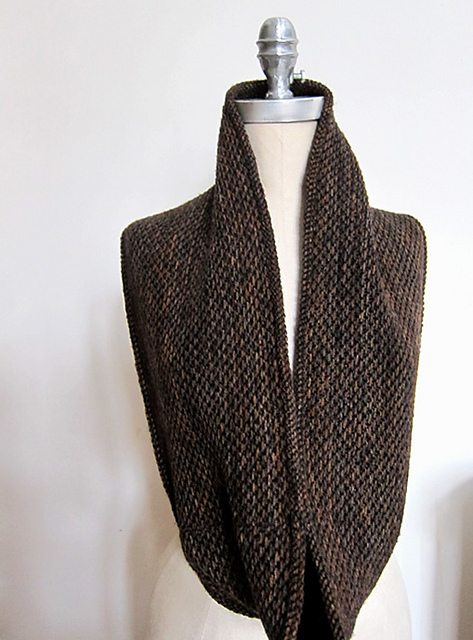 This over-sized cowl lives somewhere between cozy and classy. I love it! I don’t think I’d actually wear this jacket, but I’d love to make it. It looks like so much fun! This little draw-string bag is so cute! I bet you could find a million things to do with it! 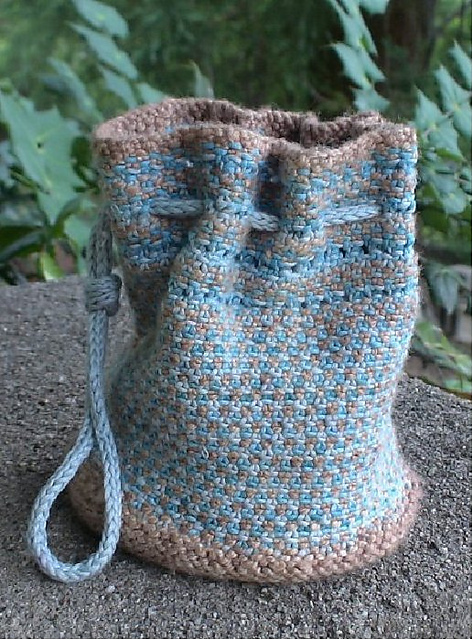 And, what a great way to use up little bits of leftover yarn. 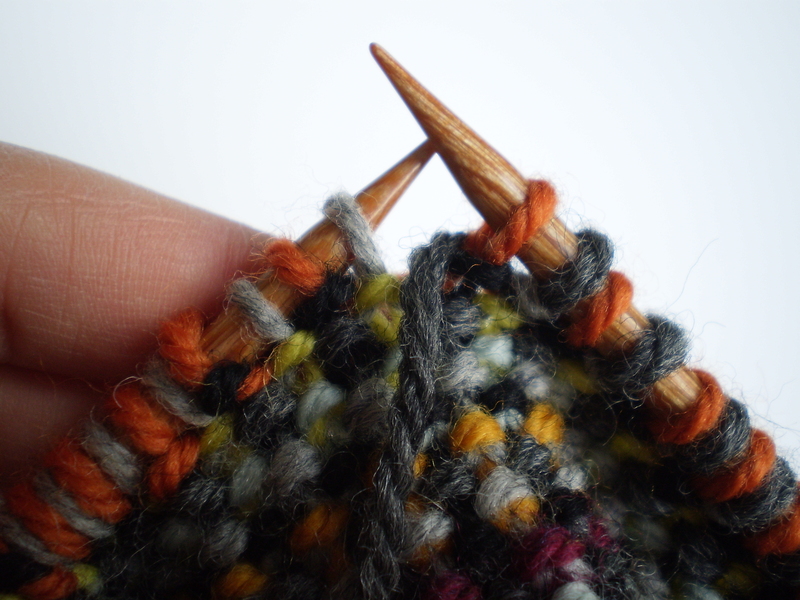 What would you use the linen stitch for? This entry was posted in Inspiration and tagged bag, cowl, jacket, knitting, knitting stitch, linen stitch, scarf, woven stitch on March 16, 2015 by onemilljellybeans. In case it hasn’t been perfectly clear in the last two years of blog posts, I am a big nerd. My husband is also a big nerd. A big exciting night with friends usually includes home-brew beer and a rousing game of Settlers of Catan. I’ve read through the Harry Potter books so many times that I can practically recite them. And, even though it’s nearly 30 years old, you’ll still find us curled up on the couch watching Star Trek: TNG whenever it comes on. So, when my husband asked me to be sure that his new sweater is long enough that he doesn’t have to preform the “Picard Maneuver,” I knew exactly what he meant. My husband has a couple sweaters he has to use the Picard Maneuver on. You can understand why he is worried about the length of his new sweater. I’ve decided not to measure the sweater. I know, crazy. 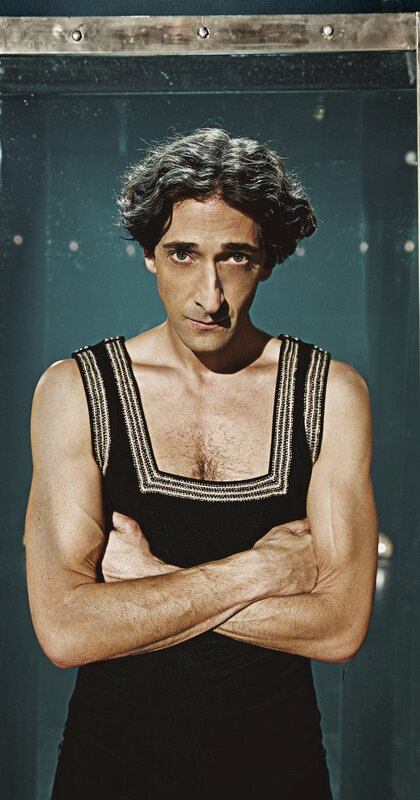 Instead, I’m going to keep knitting and trying it on him until it is the absolute perfect length. I’m hanging it up for a couple days to let the yarn sag naturally, especially since it’s cotton, which tends to droop more than wool. 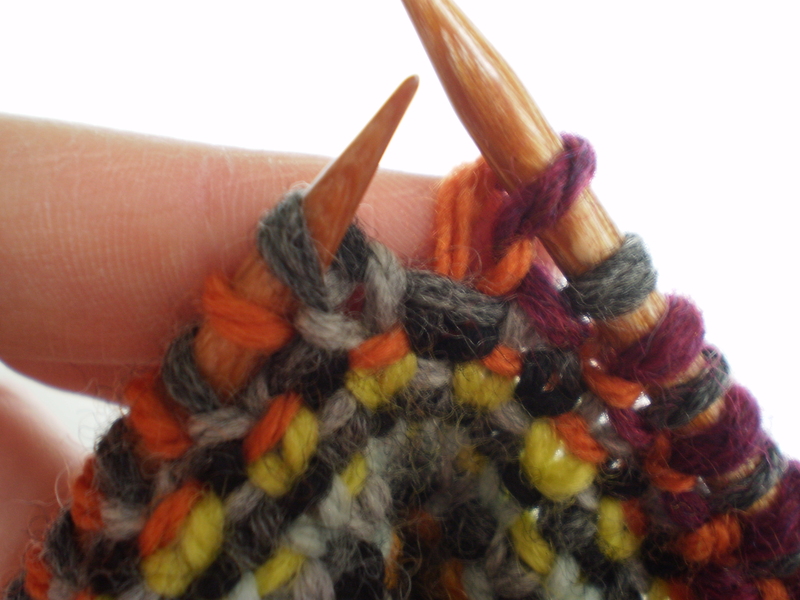 This weekend, I plan on knitting the rest of the waistband, based on how long it ends up looking on my husband. Hopefully, all this elaborate hanging up, trying on, and re-trying on will make the Picard Maneuver unnecessary. Do you have any clothes you have to do the Picard Maneuver on? How do you prevent it? 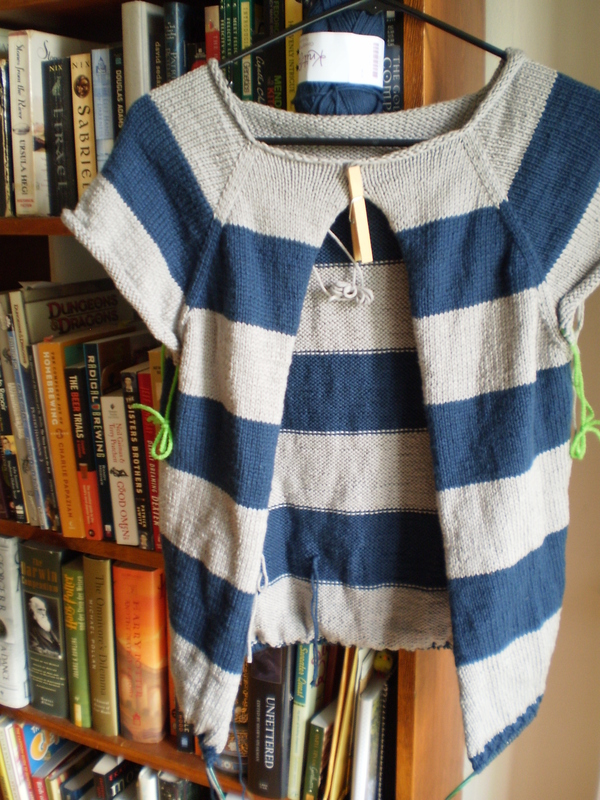 This entry was posted in On My Needles and tagged bottom, cardigan, cuff, emilien, hem, husband, husband sweater, length, picard, picard maneuver, star trek, sweater, tng on March 13, 2015 by onemilljellybeans. 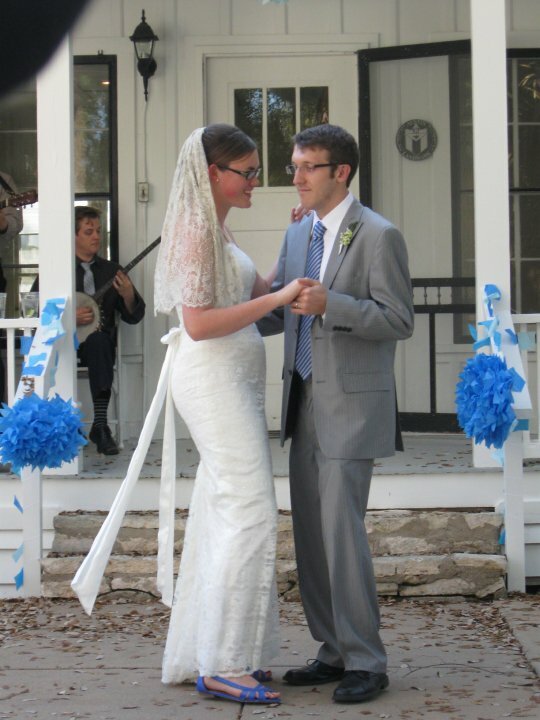 5 years ago this week, my husband and I threw an awesome party in a city park in Austin. It was pretty great. There was a swing band, a margarita machine, a taco bar and peacocks running around (because why not?). Oh, and we got married. It was probably one of the best days of my life. We had friends and family come in from across the country (and overseas) and we had the best time ever. It was a great big fun party, and the best part was that I was married to my best friend at the end of it. The traditional gift for fifth anniversaries is wood. (Who says it’s traditional? I don’t know. Someone on the internet.) But, since I’m me, and wool isn’t the traditional gift until the 7th anniversary, let’s use some creative license and look at wood-inspired knitting patterns. I love the complicated-looking cables on this hat. Very cool. Wood Hollow Hat by Kirsten Kapur The last thing I need to make myself is another over-sized pullover, but this one is so pretty, I might have to make an exception. The subtle tree-branch cables are gorgeous! 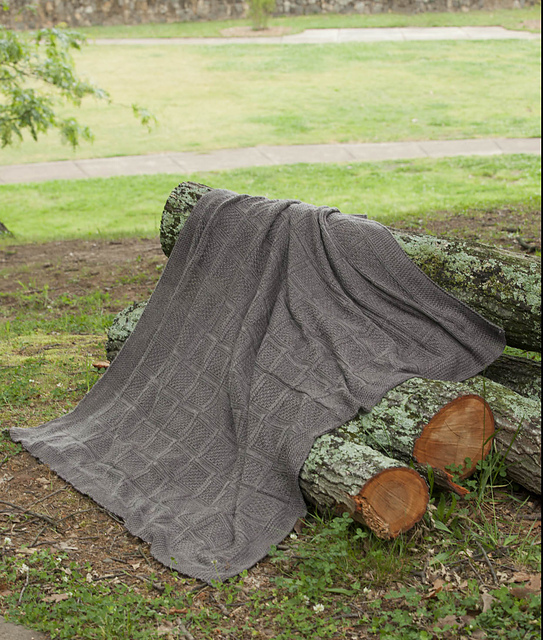 This gorgeous blanket would be fantastic over the back of a leather wing-back chair beside a fireplace in a cabin high up in the Cascades. Or, on my Ikea couch, next to my TV. One or the other. Are you married? How long? What was your last “traditional” anniversary present? This entry was posted in Inspiration and tagged anniversary, cable, fifth, fifth anniversary, hat, marriage, mittens, pullover, sweater, throw, wedding, wood, wooden on March 11, 2015 by onemilljellybeans. I love my job. Working with little kids is the greatest, and my students are so smart and goofy and interesting. I could hang out with them all day. They are little germ factories. I’ve been sick more days in the last year than in the last five years combined. And I 100% blame my students. One of them literally sneezed directly into my face two weeks ago, and another put both her fingers up her nose mid-sentence as we talked about her sewing project. Working with kids a glamorous job. That’s for sure. Long story short, I spent the weekend holed up on my couch, drinking mint tea, going through boxes of Kleenex and binge-watching Parks and Rec on Netflix (which is a totally amazing show that I had somehow forgotten about). I was half-drunk on Dayquil, and couldn’t muster the concentration to work on my husband’s sweater for more than a half a row, so I decided to do something fun, goofy, and above all else, simple. So, I got out my sock needles, scrounged up a box of leftover yarn bits, and pulled up the MochiMochi Land website. 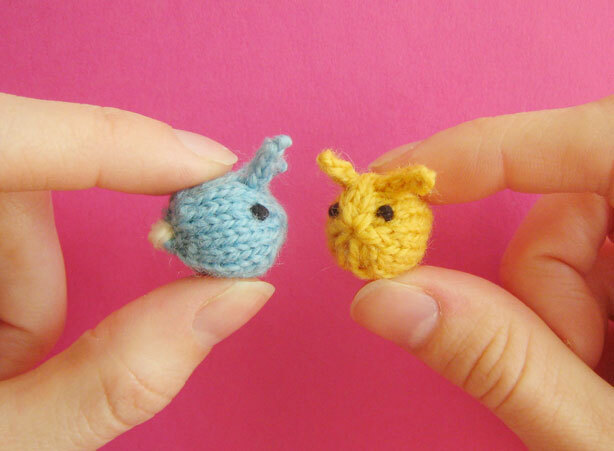 MochiMochi Land is the ridiculous (and awesome) brainchild of Anna Hrachovec, who spends her time designing tiny, goofy knitting patterns and making amazingly detailed art installations. She’s basically my hero. She has dozens of tiny patterns available on her website. 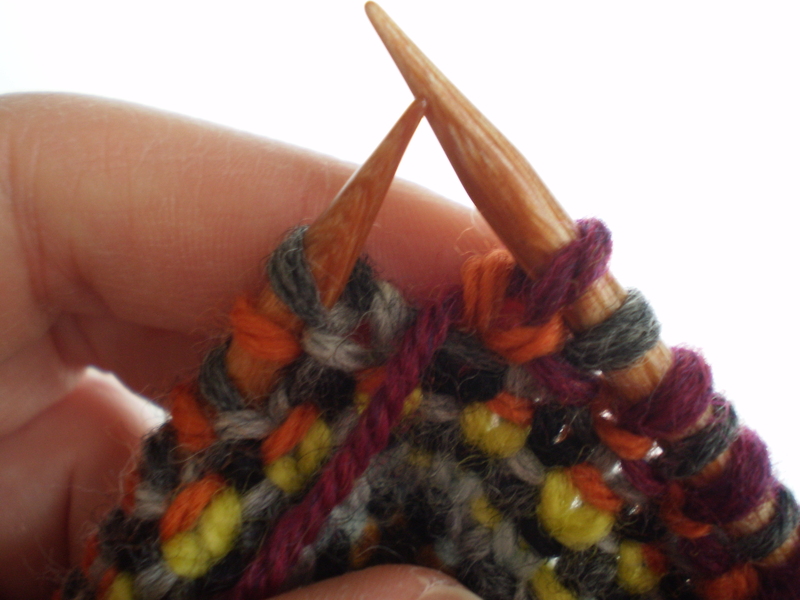 They’re perfect sick-day knitting. They’re small enough you can completely finish one in a single sitting. They’re so adorable that you can’t help but smile when you see them. And, they have no discernible purpose (other than to make you feel better). Hopefully, I’ll feel better soon. But if I don’t, at least I’ve got my tiny knitted minions to keep me company! 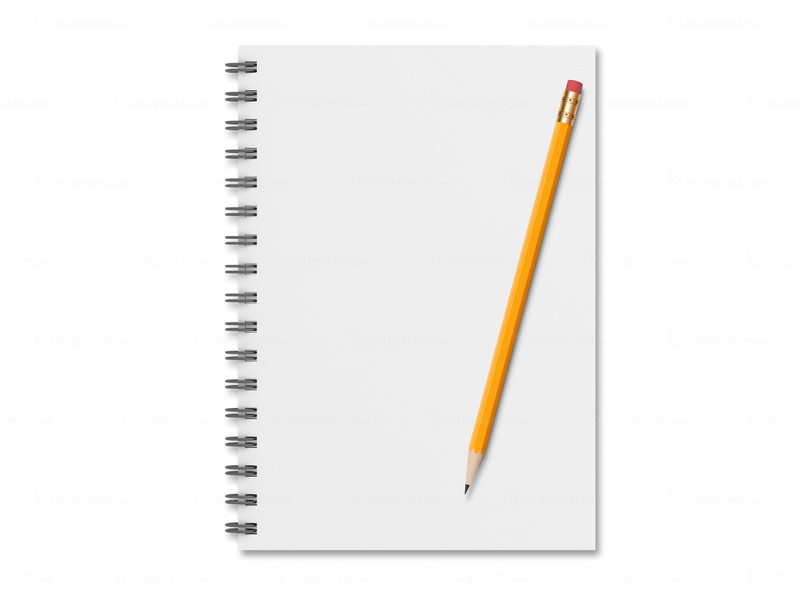 What do you work on when you don’t feel like working on anything? This entry was posted in Pattern Spotlight and tagged Anna Hrachovec, bunny, gnome, knitting, mochimochi, mochimochi land, sick, sick day, sick day knitting, snowman, tiny knitting on March 9, 2015 by onemilljellybeans.